The Trump administration appears to have threaded a needle with its update of the North American Free Trade Agreement, managing to cheer business interests and Wall Street without alienating labor unions. But labor leaders say the final deal will need to do more to protect workers to win their support. Without that, the Trump team could be hard-pressed to earn sufficient Democratic votes on Capitol Hill to ratify the pact — a task that will grow both more difficult and more urgent if the party captures one or both chambers of Congress in the midterms. Labor interests could settle instead for spelling out enforcement mechanisms in the bill that Congress takes up next year to ratify the deal. Further, labor officials say they are waiting to see whether Mexico adopts legislation to implement its own labor law reforms. In the meantime, House Democratic and labor officials gave Lighthizer and his staff high marks for seeking their input and responding to queries. The effort by the Trump trade team to keep Democrats in the fold reflects an understanding of how the political sands are shifting at a critical moment. Trade with Canada and Mexico reaches into nearly every corner of the economy, meaning interests from farmers to financial services companies have a stake in the outcome. And with Democrats in poised to make major gains in the midterms, the administration needs to court labor and environmental support, as well. And, in a reminder that lawmakers’ trade concerns are frequently more parochial than partisan, said he needs to read the small print dealing with dairy farmers. “I think they’re going to have to build a coalition to support this, and Democrats are going to be an important and vital part of that coalition,” Dingell said. For her part, she said she is seeking input from the United Auto Workers union, automakers themselves, and auto suppliers. The UAW is reserving judgment. “We think the idea and concept of the USMCA could have the potential to provide some needed relief for America’s working families,” UAW president Gary Jones said in a statement. But “given the history of loopholes in NAFTA,” he said union officials will wait until “all the pieces are put in place” before rendering a verdict. The Steelworkers and Teamsters struck similar notes in statements that criticized the deal while holding out the possibility of endorsing the final result. 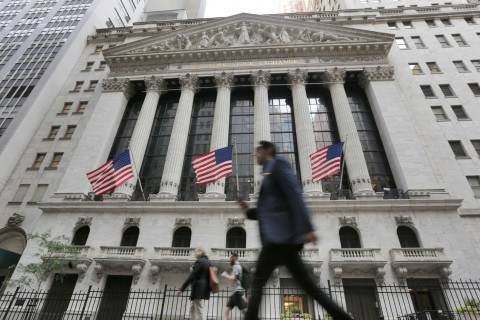 The U.S. stock market is booming, but your share of the gains probably depends on whether you voted for Donald Trump in 2016. 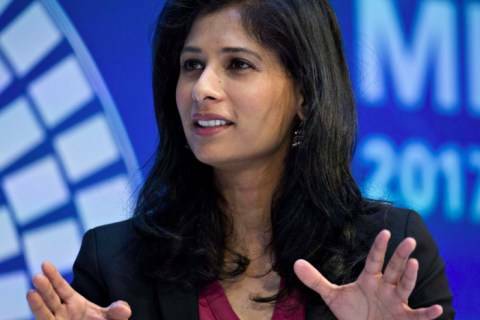 The International Monetary Fund appointed Harvard University’s Gita Gopinath, one of the leading scholars in exchange rates, sovereign debt and capital flows, as its new chief economist. 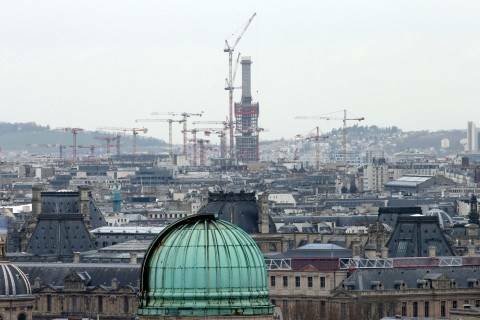 In a bleak assessment, credit ratings agency Moody's warned Tuesday that Europe remains highly vulnerable to another economic downturn despite all its fire-fighting efforts over the past few years. Claims vindication for approach. Taking a victory lap in a Rose Garden press conference Monday, Trump said he would apply his hardball tactics “with the European Union, China, Japan and potentially Brazil and India, convinced that foreign leaders take the United States seriously only if the White House threatens to upend economic ties,” The Washington Post's Damian Paletta and Erica Werner write. "But many economists and trade experts say the president’s forecast may prove overly optimistic, given the limited changes that are envisioned and the powerful economic forces that already have reshaped regional commerce. While some industries and regions would fare better than others, the sheer size of the $20 trillion U.S. economy will probably swamp those specific effects... 'This isn’t a revolutionary deal. It’s a modification of a deal already in place,' said Eric Winograd, senior U.S. economist at AllianceBernstein, an investment and research firm. 'The total economic impact will be very small. I do not expect it to boost the U.S. economy.'" “White House agrees to expand Kavanaugh probe slightly as McConnell signals vote is imminent.” The Post’s Devlin Barrett, Josh Dawsey, Seung Min Kim and Matt Zapotosky. “‘Little lies point to bigger lies’: How James Comey thinks the FBI could investigate Kavanaugh.” The Post's Amy B Wang. “White House tells F.B.I. to interview anyone necessary for Kavanaugh inquiry.” The New York Times's Peter Baker and Michael S. Schmidt. “Comey offers to testify in public about GOP's FBI bias claims.” Politico's Kyle Cheney. — GE names first outsider CEO. The Post's Tom Heath and Jena McGregor: "Decades of stagnation at the company have taken a toll — a decline that culminated Monday in the surprise ouster of the company’s chief executive, John Flannery, after only a year on the job, and its announcement that it will take a write-down on its massive power business, effectively absorbing a $23 billion loss in the process... The company was plagued by strategic missteps, including poorly timed investments. It expanded into the power and oil industries at market peaks, paying top dollar for what turned out to be mediocre investments. It sold off portions of its financial portfolio, GE Capital, at near market lows. 'The market didn’t even give the company the benefit of the doubt that things would work,' said Ivan Feinseth, chief investment officer at Tigress Financial Partners. 'Flannery’s plan hasn’t worked.'" — Companies curb political spending. WSJ's Theo Francis: "The biggest publicly traded companies are increasingly limiting their spending on elections and other political activity, a new report has found... Among the 414 companies that have remained in the S&P 500 since 2015, increasing numbers are either prohibiting or fully disclosing direct contributions to candidates, and contributions for election-related use to trade associations, so-called 527 groups and other nonprofits. About 36% of the S&P 500, or 176 companies, have said they won’t engage in at least one form of spending on political activity, up from 32% a year ago and a quarter in 2015, the report found." The American Enterprise Institute hosts a conversation with Jamie Dimon, chief executive of JPMorgan Chase. Senate Small Business and Entrepreneurship Committee hearing on “expanding opportunities for small businesses through the tax code” tomorrow. Senate Banking Committee hearing on fighting money laundering on Thursday.